Earth Gear has brought together some of the most beautiful Rustic Lighting to help you showcase your fabulous rustic inspired home. The proper lighting can give your home warmth and depth. It’s an important element in your design is the crowning jewel in finishing the room. Earthy textures and tones bring a rustic light fixture to life and brings the feeling of nature into your home. Gigantic faux antler chandeliers in the entrance way of a log home, drop pendant lighting over your kitchen island, and a log based lamp next to your favorite chair in front of the fire place. It’s all here for you to choose from. Nothing suggests winter serenity like the stark silhouette of bare birch trees. This table lamp is no exception, with its raw log-like base and birch shade that casts a peaceful glow from any side table. Laser-cut iron creates a landscape of tree trunks, with a hand-painted bronzed finish and inner linen liner to spread the light. Forecast: Serene. Scaled especially for high ceilings, our Paxton Pendant is a show-stopping piece. The shades are crafted of handblown glass in eclectic shapes and feature a mottled texture with a subtle green hue. Like the fixtures in alpine mountain lodges, this chandelier has a warm, rustic charm. The antlers are carefully sculpted then painted by hand to create their natural look. Designed to provide generous illumination over a bar or long dining table, this ceiling-mounted lighting is an eye-catching alternative to a chandelier. With its sand-cast metal frame and hand-forged rings, the Octavia Chandelier has an authentic artisanal look and feel. The bronze finish is accented with a single, large crystal droplet at the base. Our pendant’s caged design resembles the look of traditional fishermen’s lanterns. 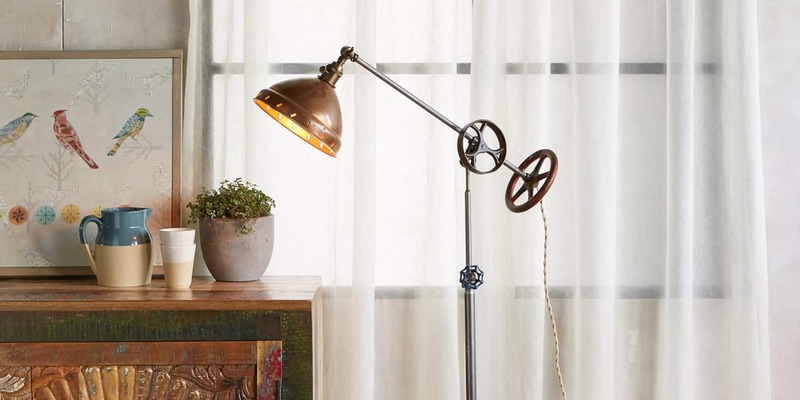 The steel frame is distressed by hand for a rustic, weathered look that creates a handsome contrast to the spherical blown-glass shade.